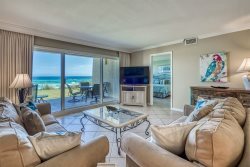 Close to everything including the Beach, 30A, Grand Boulevard, SanDestin and Baytowne Wharf. Just minutes away from the sugar white beaches of the Emerald Coast. We welcome you to an amazing and relaxing stay at our beautifully decorated condo! Close to the stunning Gulf Coast beaches with crystal clear blue-green waters and sugar white sand. Take a right on Hwy 30A and drive or bike a short ½ mile to Tops'l State Preserve Park. The park provides a free tram ride to 3 miles of unobstructed white sand beaches has plenty of free parking, restrooms and bike racks. You can choose to go to four other public beach accesses within a 2-mile radius. Topsail Village is on Hwy 30A and has access, without crossing 30A, to the 31 mile Hwy 30-A bike path. We are close to local favorites like Stinkey’s Fish Camp, Elmo’s Cafe (across the street) and for shopping, Gulf Place on 30A & Grand Blvd on Hwy 98. Our condo maximizes the large space with the living room, dining room and kitchen in open concept. This unit has three bedrooms plus a bonus room that is set up as an additional sleeping room. The furnishings feature a relaxing, easy comfort feeling as you are surrounded by a warm soothing color palette. The kitchen has Stainless Steele appliances, granite counter tops and an island with seating. The living room offers comfort while you enjoy great conversation or the large flat screen TV. The dining area is situated at the windows for full views outside. There is a washer/dryer in the unit. Topsail Village has easy access to the Scenic 30-A bike path, and Tops'l State Preserve Park which features 3 miles of unobstructed white sand beach along the Gulf of Mexico. Common area amenities include a swimming pool, pool restrooms, and bike racks. Add $175 for housekeeping and 11% for tax. $69 damage protection; 2.25% to process credit card payments. 25% of the total is due at booking and will hold the unit for you. The remaining balance is due 30 days prior to your arrival.